Success in a management role doesn’t just depend on one specific skill or strength. Leaders must be able to demonstrate a number of key skills that they can call upon when needed to perform effectively, drive organisational goals, get the best from their team, and successfully tackle issues and challenges as they arise. Here’s what needed if you really want to succeed in a leadership role. Time is money. After all, there’s only so many hours in a day. The more effectively you can manage your time, the greater your productivity will be. In other words, the more you can get done, the better your organisation will perform. Fortunately, when it comes to acquiring these skills, there’s a lot of help out there, including numerous time-management tools and techniques you can learn to help you use the time available to you more effectively. The key here is finding the ones that work best for your role and the way you like to work. Life often seems to be all about communicating and negotiating. Whether it’s tackling shared issues with loved ones and colleagues, or getting the best deal on your living costs, being seen as a good communicator and negotiator can seriously help you further your career. Every good employer knows the value of having a good influencer on board and will be happy to pay for someone who can use those skills to motivate a team of workers and drive the business forward. A certain level of stress is inevitable in the workplace, as well as in our day-to-day routine, but it’s how we deal with stress that’s key to successful outcomes in our personal life and our working life. Ultimately, this is what will help us achieve our career aspirations. Letting stress spiral out of control isn’t just bad for those close to us at home and at work, it can affect us physically, causing a wide range of health issues from depression to heart disease. Which is why it’s vitally important to be aware of the triggers that cause stress in our everyday lives. Once we can do that, we can take action to combat stress and perform more effectively in the workplace. Which brings us nicely onto our next important life skill - creative thinking. Creative thinking is one skill that can help us deal with stress. As the key to problem-solving, sound creative and analytical thinking enables us coming up with innovative approaches to deal with challenging scenarios and situations. The good news is, while many people are naturally gifted when it comes to creative thinking, it is something that can be learned. As Albert Einstein once famously said: ‘Creative thinking is intelligence having fun.’ It basically comes down to analytically deconstructing a problem or situation into its components and methodically looking at ways to tackle it. Another skill that is commonly perceived as being one you either have or don’t have, is the ability to speak to an audience - whether that’s a sales pitch, a company meeting or a job interview. In fact, 40% of the population dread public speaking, which is probably why so many people get nervous when it comes to taking the mic. However, just like creative thinking, it’s something you can learn. The key here is practice, practice, and more practice. Learn from watching those who are good at presenting and public speaking. Use positive visualisation to beat the nerves, do breathing exercises and take your time. Along the way, you’ll pick up confidence and fluency. It’s a skill well worth acquiring, especially in sales. 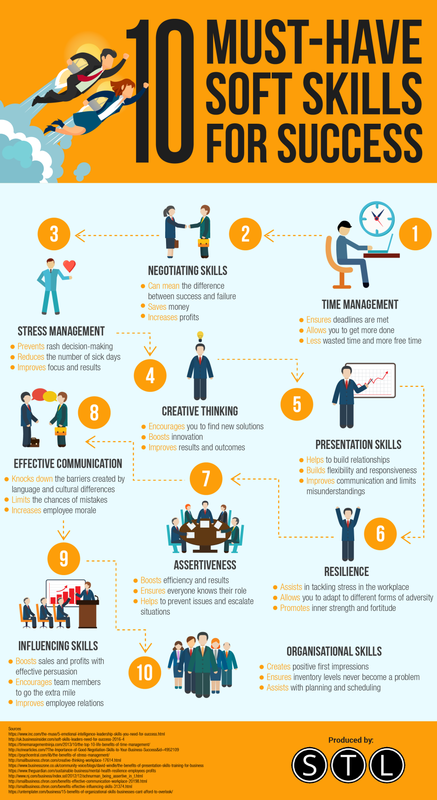 Great presentation skills are in high demand by many employers and will significantly enhance your career prospects. To become more confident, positive and effective, leaders must be resilient and assertive. Contrary to what many think, assertiveness is not about aggression, or ‘getting your own way’, it is in fact based on mutual respect. It’s about diplomacy and being respectful of others and their opinions, but also standing up for what you believe in, or consider to be the best way forward, based on your experience and knowledge. Likewise, resilience is the ability to cope with failure and rise to challenges. In many ways, resilience and assertiveness rely on many of the other skills we’ve touched on here, such as using communication and influencing skills to build relationships, and creative thinking to solve problems. While some people are natural leaders, as with so many things in life, being truly successful means putting in the time and the effort to consolidate and fine-tune the essential skills needed to excel in the workplace, as in life.